Not for Western Australia, Tasmania & Northern Territory. The pictures you see around this listing are of some of the many native plants we often have at Plantinspirations. The plants you are purchasing in this listing will be 12 - 20 cm tall (the height depends on the bottle brush variety) and each plant will be in its own individual 50 by 70 mm or 40mm by 80mm pot, each plant will have established roots and will be ready to plant into your garden. 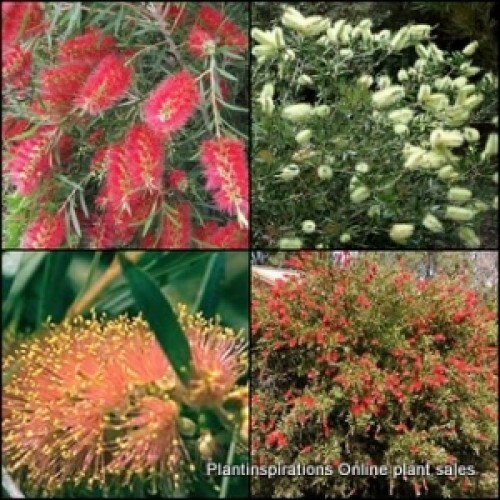 We have 8 to 20 varieties of callistemon in stock and will send you a random selection from what we currently have in stock. You will definitely receive 8 bottlebrush plants. 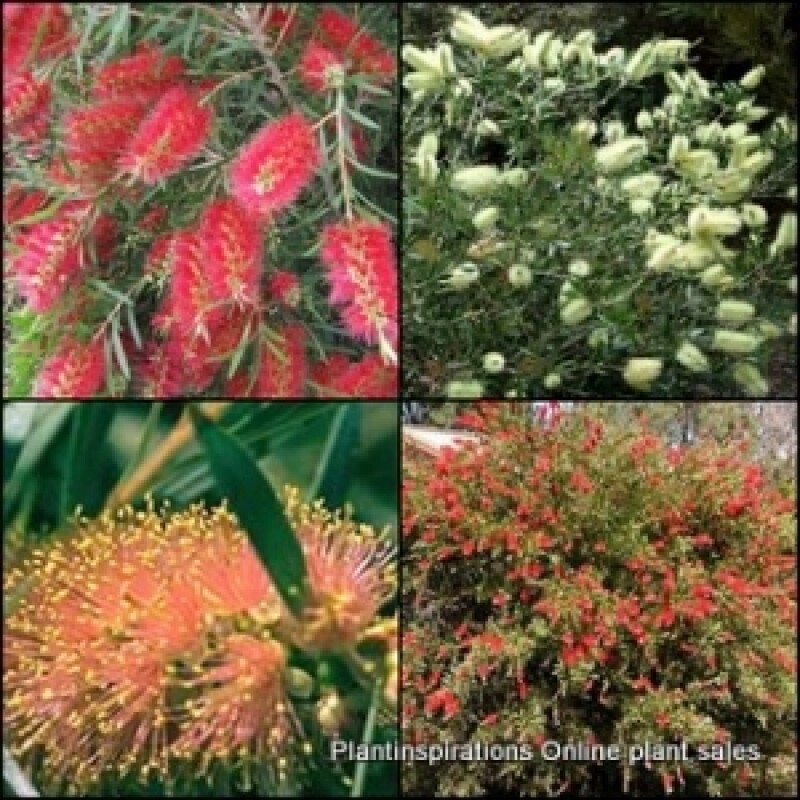 If you want specific varieties of bottlebrush please email our staff to see which varieties we currently stock. They will also grow in most frost prone and coastal areas. They are able to handle dry regions when established and are recognised as being able to be maintained as a hedge. They pretty much look after themselves once established. Work well in scattered plantings,within native settings or as borders, hedges and windbreaks. They can be trimmed back after flowering and maintained as a hedge or screen. They grow the large masses of bottle brush flowers that are seen in gardens through out the world. They all attract birds to your garden. Below is a list of some of the varietes we normally have in stock. We do not guarantee you any variety though as this is a random listing. This is a very popular profuse red flowering low variety that will reach a height of around 1.5 to 2 metres tall. A semi cascading variety that is hardy and adaptable. Will grow to around 2-4 metres high and will make a good screen as well. This is a weeping form of the red bottlebrushes. Has been known to produce pink flowers as well. This variety occurs much of Australia from Act, Queensland, NSW, Victoria and Tasmania & Northern Territory. Adaptable and fast to grow, this variety flowers from spring, summer and into autumn. 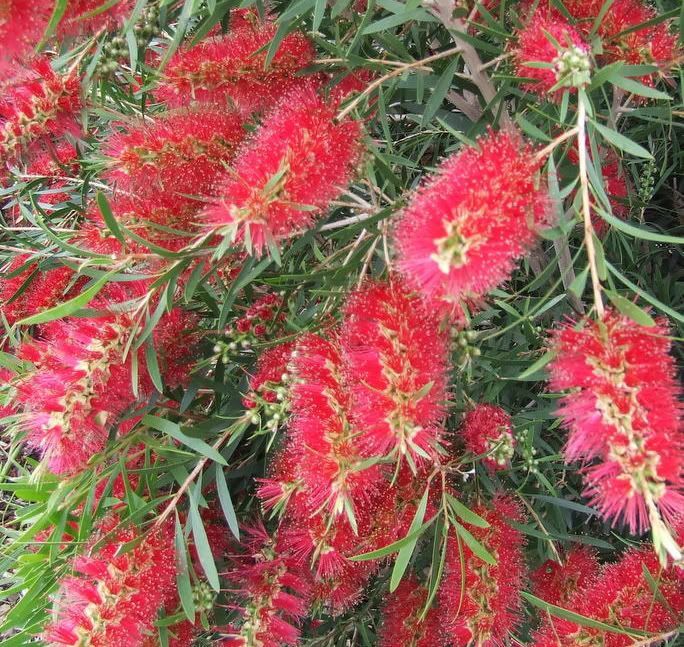 Once established Callistemon (bottlebrush, bottle brush) will handle long periods without rain but will also grow well in quite wet conditions. We often have a dwarf variety called Little John in stock.